sprouts and leeks. Ironically frozen peas give this it's fresh light flavour, aided by the fresh and dried tarragon which give this it's distinctive taste. A little fresh garlic grated into the soup as it simmers along with lemon juice at the end of cooking are added in before seasoning well and blitzing. If like me you are reducing your high blood sugar by following the ketosis diet, you can add high fat ingredients like butter to toast some almonds in and a generous dollop of Philadelphia full fat soft cheese as tasty toppings for this nutritious lunch. I just cut the hard stalks from the sprouts and remove any dirty or damaged leaves and thrown them in a pan with some butter, gently heating. Trim and slice the leeks vertically to give you a chance to part the curls and wash between them. Then slice the leeks and add to the gently sweating pan. Once the leeks have softened a bit you can make up the stock cube with boiling water and add that to the pan along with the fresh and dried tarragon, and simmer for twenty minutes or until the sprouts are nicely soft but haven't changed colour to that kind of over-cooked sludgy green, as that will spoil the bright green freshness of the soup. Towards the end of the cooking I throw in the peas, because they don't need actual cooking and will, like the sprouts, lose their fresh greenness if left in boiling water too long. At this stage I grate a clove or two of fresh garlic in, along with a squeeze of lemon juice to taste. Season well. When it's cool, blitz it into a thick soup. Heat the butter in a frying pan, and throw in the almonds, making sure they toast both sides but don't burn. 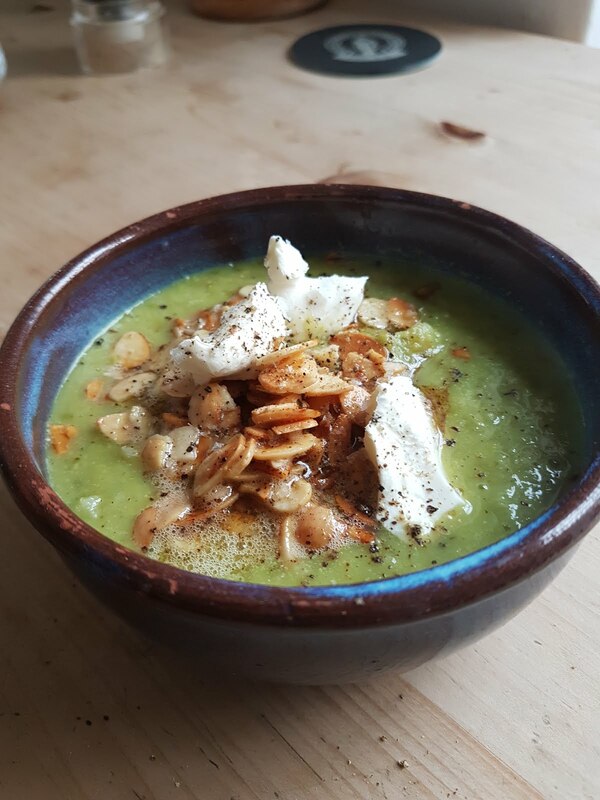 This lovely bubbly butter mixture can be poured onto the soup once the almonds have changed colour, or you can combine the soft cheese in with it to heat and melt before pouring. Otherwise, just spoon the cheese on separately. Either way its lovely with a good grating of black pepper and some Maldon Salt for texture and crunch. There's lots of fibre in this meal too. Enjoy!